Enjoy 20% Discount with Dolphin Fast Ferry until February 2019! We are thrilled to announce that the newly-launched Dolphin Fast Ferry has joined Easybook to make trips between Batam and Johor Bahru as convenient as possible at the cheapest fares! Established in May 2018, the company mainly operate services between Batam in Indonesia and Johor Bahru in Malaysia. Dolphin Fast Ferry currently have limited number of ferries in their fleet but there will be a total of 10 ferry units expected to serve Batam – Johor Bahru route with return trips. This brand-new Dolphin Fast Ferry offers complete facilities in their fleet with 148 standard and 20 VIP cushioned seats including air-conditioned and a television. CCTV is also installed for safety purposes. There are free shuttle services provided at Larkin Sentral Bus Terminal in Johor Bahru that takes you to Puteri Harbour conveniently to board with Dolphin Fast Ferry at very low fares. Easybook users can enjoy a discount worth 20% by using the promo code DOLPHIN20. It is priced at RM64 for returned trips between Puteri Harbour in Johor Bahru and Batam Center in Batam with the last departure date on 28th February 2019. Seize the occasion and book cheap Dolphin Fast Ferry tickets at Easybook before it ends on 28th February 2019 as well. * The promo code DOLPHIN20 must be entered upon checkout, discount of the booking price excludes all applicable taxes and charges. 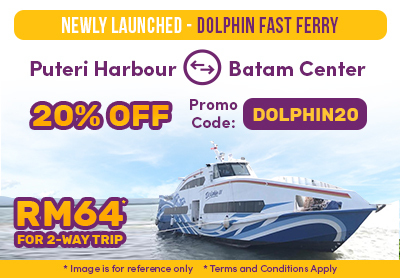 * It is applicable only for Dolphin Fast Ferry ferry bookings between Puteri Harbour in Johor Bahru and Batam Center in Batam which made through Easybook website, mobile website and mobile app (Android & iOS). * The discount code is valid until 28th February 2019 only. * The discount code is valid for trip departures from now until 28th February 2019.